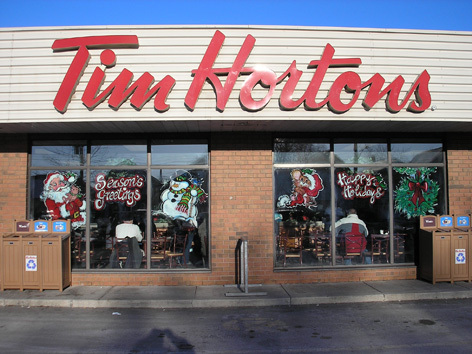 Louise and I went to have a coffee at the Tim Horton’s that we normally go to today. I noticed when we walked in that the windows hadn’t been painted with a festive Christmas scene like they always are at this time of year. I wondered if it had anything to do with the economy. There are a lot of companies that are scaling back Holiday spending in favour of keeping people working. It is the right thing to do, but I know that everyone enjoys this time of year no matter how much they grouch about it. Just as we were leaving the window painter came in and started to get busy. He said he had three more Tim’s to paint today. I turned back to Louise and we talked about slide rules and someone else joined the guy at the table behind me. We moved on to discussing how bad drivers are and why people do the stupid things that people do. I hadn’t noticed the slide rule guy leave his table, but he came back with the slide rule. He handed it to Louise and she slid the slide back and forth a few times, making the comment that she couldn’t remember how to use one anyways. He said that it was easy and Louise went over to the table and they multiplied 3 X 2 and came up with six. He smiled and nodded and went on writing some indecipherable symbols on the blackboard that the Mayans would be proud of. Not all math teachers are dicks, but this guy was, and I have the sneaking suspicion that the guy at the table behind me at Tim Horton’s just might have been a math teacher. He did smile and tap the slide rule.